What do The Donald, the Olympics, driverless cars and athleisure have in common? 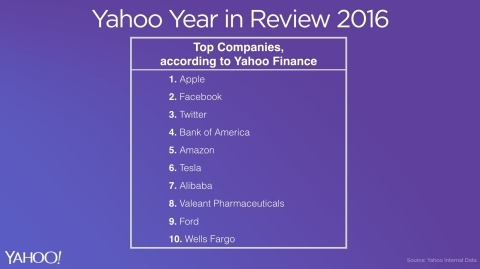 SUNNYVALE, Calif.--(BUSINESS WIRE)--Yahoo (YHOO) today announced its annual 2016 Year in Review report. Entering its 15th year, Year in Review offers a detailed look into what intrigued the hearts and minds of millions of users worldwide throughout the year. What’s in a year? 2016 saw the Olympics in Rio, new celeb feuds and unexpected splits, street style taking over the designer runways, Damn Daniel! and his white kicks…all capped with a seemingly endless election cycle. Based on interactions with Yahoo, Polyvore, Flickr and Tumblr, here is what captivated the world. It’s no surprise that the 2016 U.S. Presidential Election and President-elect Donald Trump, were the most searched frontrunners this year. Women also dominated the list with six out of the 10 spots filled with the likes of Gwen Stefani, Jodie Sweetin, Megyn Kelly and the Democratic presidential nominee, Hillary Clinton. Kim Kardashian-West took the year off from “Breaking the Internet,” which allowed Khloe, for the first time ever, to beat her sister as most-popular Kardashian on Yahoo. After being on the market for nearly a decade, the ever-popular role-play game, Roblox, also made an appearance on this year’s most searched list. The news stories that grabbed headlines and secured the most page views from Yahoo readers this year reflect 2016’s political landscape, as well as the tragedies and natural disasters that unfolded across the globe. Polyvore’s global community of fashionistas saw athleisure reigning supreme with style staples like Adidas Superstars, Nike Air Max Theas and bomber jackets gracing the top 10 list once again. Formalwear wasn’t just left on the red carpet with tulle skirts, cape dresses and gatsby dresses making appearances. To learn more about Polyvore’s most popular fashion and beauty moments in 2016 and how to style these must-haves, visit http://blog.polyvore.com/. Move over Brangelina. Arguably this year’s most notable split comes from the music world, with Blake Shelton’s former and current leading ladies, Gwen Stefani and Miranda Lambert making Yahoo’s top celebrity list. Not to be outdone, Taylor Swift and Katy Perry, and exes Justin Bieber and Selena Gomez showcase just how buzzy celeb feuds were throughout 2016. 2016 saw the loss of two music industry revolutionaries, David Bowie and Prince, who both made our top music artists list at No. 1 and 3 respectively. Britney Spears and Lady Gaga both hit the list following the release of their first albums in three years. 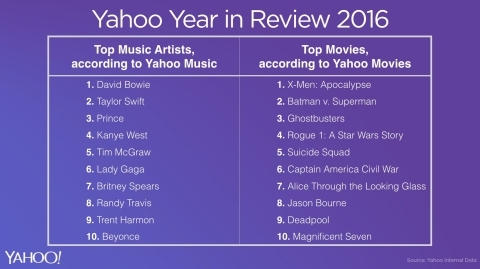 No music list would be complete without Queen Bey, who rounded out Yahoo’s top musicians of the year. It was clear movie-lovers needed a superhero to get them through 2016; X-Men, Batman, Superman and Captain America graced both the silver screen and the Top Movies list. Other blockbusters on the list included Sci-Fi flicks like Ghostbusters and Suicide Squad. It was a busy year for sports stars. Olympic headlines reached top spots including an old, misinterpreted photo of gymnast Shawn Johnson, the crowd’s disapproval of Hope Solo, and the men’s USA basketball team’s visit to a Brazilian brothel. The tragic losses of boxing legend, Muhammad Ali and young MLB star, Jose Fernandez, also made the top sports moments list. As the world came to expect, the highly anticipated unveiling of Apple’s iPhone 7 and 7 Plus was the top highlight on Yahoo Finance this year. The ever-evolving tech industry saw shakeups, controversies and innovation throughout the year, which pushed Facebook, Twitter, Amazon, Tesla and Alibaba on to this year’s buzziest companies list. The Top 25 Flickr photos of 2016 were carefully selected based on engagement and community factors from billions of pictures uploaded this year. Whether in remote natural settings like in the No. 1 photo taken at the Aveiro Lagoon in Portugal or in dense urban centers like in photo No. 9 taken at the Palais du Luxembourg in France, this year’s top snaps celebrate the photographer’s eye for beauty. Identity was a key theme across the Tumblr community in 2016, which is why it’s no surprise that the Top Meme of 2016 was Tag Yourself -- a slew of cute pop-culture references that prompted users to pick a meme they most identified with. Feminism was the most discussed social issue. To learn more about Tumblr’s most popular fandoms and trends in 2016, visit tumblr.com/2016. 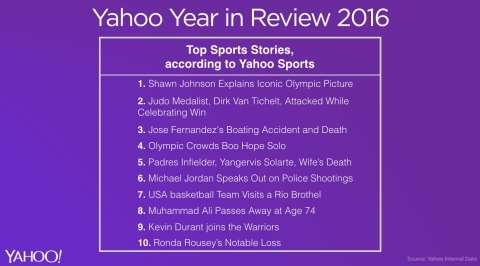 What do you think of Yahoo’s Year in Review? 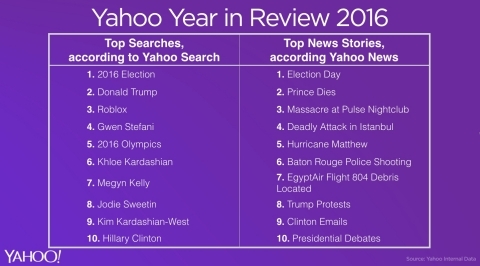 Let us know on social using the hashtag, #Yahoo2016inReview. To develop the Yahoo Year in Review, our editors analyzed Yahoo Search queries and Yahoo Media article readership based on a number of factors, including absolute volume and the growth from previous periods. This is done to see which themes and trends bubble to the surface. Individuals, their Search queries and their readership of articles always remains anonymous. Top searched refers to searches with the highest volume. Top headlines refers to articles and stories with the highest readership. Yahoo is a guide to digital information discovery, focused on informing, connecting, and entertaining through its search, communications, and digital content products. By creating highly personalized experiences, Yahoo helps users discover the information that matters most to them around the world -- on mobile or desktop. Yahoo connects advertisers with target audiences through a streamlined advertising technology stack that combines the power of Yahoo's data, content, and technology. Yahoo is headquartered in Sunnyvale, California, and has offices located throughout the Americas, Asia Pacific (APAC) and the Europe, Middle East and Africa (EMEA) regions. For more information, visit the pressroom (pressroom.yahoo.net) or the Company's blog (yahoo.tumblr.com).